From vintage charms and hand-stamped baubles to filigree work maang tikkas, and silk yarn and silver chunky necklaces, a girl’s gotta have her jewels. And aren’t you lucky if you are a Bangalore girl, because all of these gorgeous jewellery is up for grabs right here in our fair city. We introduce you to ten Bangalore-born and bred jewellery labels that have our hearts. Jhumkas, balis, hoop and wire earrings, wax bead, chunky silver, or ribbon necklaces, cocktail rings and vintage-esque silver bangles form the core of Benaazir Mukherjee’s stunning jewellery collection. We especially love her peacock kada, traditional chukkas, and the elegant exa bead necklaces. We discovered local label Quirk Smith at Kitsch Mandi and were besotted by their bold designs that mix elements of antique with modern details. Old coins, nuts and bolts, tribal motifs and shapes form the core aesthetic of this label. We especially like their D-shaped metal bangles, a carved metallic pair of scissors which moonlights as a brooch and spear-shaped earrings available in gold and silver hues. Jewellery designer Mrinalini Cariappa works with a combination of rare and interesting semi-precious stones and silver. Her intricate designs are inspired by nature. Expect earrings, finger rings and pendants in geometric shapes, those embellished with beautiful multi-hued stones, and intricate workmanship. Widad Mogral of Rumaancrafts is a hands-on jewellery maker. She works with silver and copper using wire-wrapping and metal-smithing techniques. Delicate flowers and leaves, stamped jewellery, and experiments with textures are some of the highlights of Widad’s jewellery label. Sankeerthi Aipanjiguli of Rabbit Out of the Hat collects vintage and antique jewellery from different parts of the world. All her pieces have an interesting story behind them. 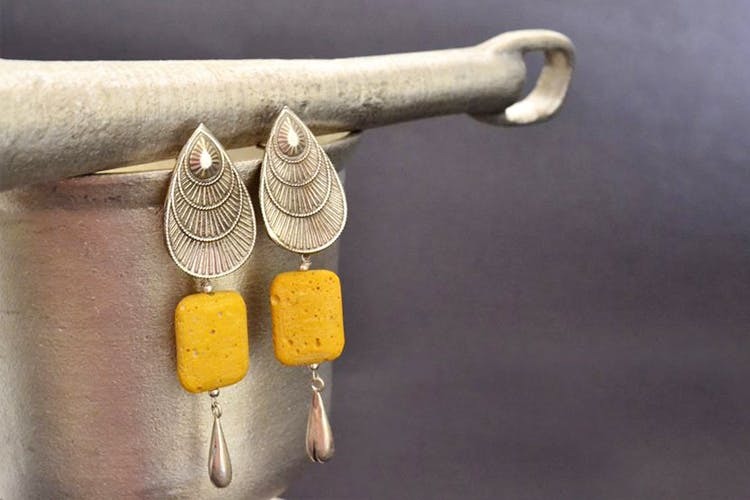 Deepti Sudhindra’s The Jewelry Project offers a mix of contemporary and traditional Indian designs. Expect stacked rings, layered necklaces and statement earrings along with maang tikkas and hath phools, all done using filigree work in sterling silver or with semi precious stones. Chinanshu Sharma of Paarisha works with vibrant silk yarn and weaves them into beautiful pieces, embellishing them with metal, antique coins and semi precious stones. Rituparna Das and Angeline Babu started Silver Nut Tree, upcycling PET plastic bottles into jewellery. They have now added semi-precious stones, copper and wire wrapping craft to their work. Our favourite: their adorable bottle cap earrings, which comes with some colourful handprinted patterns. Poornima Narayan of Vermillion works with silver, copper, gold, and precious/semi precious stones. Especially interesting are her bold chunky necklaces with wood, beads, and silver spikes or even earrings that marry intricate patterns in silver with the texture of wood. Suguna of Koral tree makes handcrafted polymer clay jewellery. The designer goes beyond just clay beads and instead creates traditional jhumkas with floral themes (the lotus ones are especially pretty). She also does danglers and studs, necklaces and necklace sets (with semi precious stones and fresh water pearls).